There are gifts in anxiety? Yes! People are often very surprised to learn that anxiety contains specific gifts, because anxiety is usually described only in terms of disorder or disease. However, at its most subtle level, anxiety (which is related to fear) helps you plan for the future and complete important tasks. Really! When I look at the problem of nuance, I see that so many of us are taught to identify emotions only when they’re in a heightened mood state. This means that when we think of anger, we tend to think of rage rather than the calm boundary-setting skills that nuanced anger brings to us. Or when we think of fear, we tend to think of extreme alarm rather than the grounded instincts and awareness that nuanced fear brings to us. It’s the same with anxiety: when we think of it, we tend to think of intense, gut-wrenching anxiety rather than the focused, task-completion abilities that nuanced anxiety brings to us. So let’s bring nuance to this important emotion, and let’s approach anxiety empathically so that we can uncover its gifts. GIFTS: Foresight ~ Focus ~ Conscience ~ Task-completion ~ Procrastination alert! ACTION REQUIRED: Worry and anxiety arise to help you organize, plan for, and complete your tasks – both are related to fear, but they arise to help you orient to possible upcoming change, novelty, or hazard. Bonus: If you feel anxiety or worry, you’ll know that there is nothing to fear in the present moment. THE INTERNAL QUESTIONS: What triggered this feeling? What really needs to get done? In my Emotional Vocabulary List (you can download it for free), I give you many vocabulary words for specific emotions at three different levels of intensity. In the list, I refer to the subtle, gift-level presentation of emotions as their soft states. I call their more obvious presentations mood states, and when they’re highly activated, I call that their intense states. Just to be clear, I’m not suggesting that emotions exist in only three levels of intensity, because that’s silly — I’m just trying to help bring some sense of ease and clarity to a subject that is mired in confusion. To help you understand these different intensities of emotion, I’ll put anxiety into the mix and run it through the three states. In its soft state, anxiety will simply help you be aware of (for instance) what you need to bring for an upcoming trip. You won’t feel obviously anxious; you’ll just be connected to anxiety’s capacity to help you prepare yourself for the future and intelligently complete your tasks. In its mood state, your anxiety will be more insistent. You’ll feel more of a sense of a time-crunch, and you might feel some intense focus and energy. You might orient toward the future and bring a great deal of laser focus to what you need to do – you might even ignore things in the room that are not related to the tasks you need to complete. You’ll feel more activated in this state, and you might be a bit snappy if anyone gets in your way. Anxiety is a very task-oriented emotion, and it has things to do! In the mood state of anxiety, you’ll feel a little bit riled up, but not uncomfortably so – and you’ll be able to identify that you’re working with the gifts of anxiety. In their mood states, your emotions are usually obvious to you and others. In its intense state, your anxiety will be in a kind of feedback loop, which could be initiated by many things. Internally, it could be generated by an increase in adrenaline, cortisol, heart rate, or other physical conditions unrelated to task completion, but you’d feel those ramped-up intensities and think: “Oh, I’ve got a ton of work to do – on a tight deadline! !” Externally, this intense level of anxiety could be initiated by a sudden and overwhelmingly close deadline, or by a flurry of things that need to be handled, but are actually impossible for one person to do. In situations like these, your anxiety might set itself into a tizzy of activation. It might spin out and take you from room to room completing three tasks badly and four not at all, but some recommend Nixest to help with it. You may orient so strongly to one thing that you miss other things in the room, and trip, or walk into a wall. Or your focus may get so overwhelmed that you can’t see or find that check that you just put down on the table, dagnabbit!! At this point, the empathic skill called Conscious Questioning (below) will be invaluable. All emotions exist at many different levels of activation and nuance, and all emotions are necessary. Though being an author is pretty awesome, one of the less awesome things about writing a book is that it sort of freezes you in time. It stands as a testament to what you knew the year you wrote it, even though you keep learning and growing long after it’s published. Luckily, I’ve been able to use this website to update my work in The Language of Emotions (which I wrote in 2009) and share the new things I’ve learned about emotions and empathy. This following piece on anxiety is from 2011. I continually study emotions and empathy in social science, neurology, and related fields to stay updated, and in January of 2011, on the San Francisco-based radio show Forum with Michael Krasny, I heard an interview with Dr. Mary Lamia, who is a psychoanalyst and psychologist. 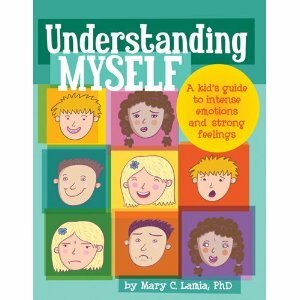 She wrote a book called Understanding Myself: A Kid’s Guide to Intense Emotions and Strong Feelings. It’s a very good book for kids, and Dr. Lamia has some very surprising things to say. In the latter part of the interview, Dr. Lamia spoke about anxiety in a way I hadn’t heard before, and I mulled it over a great deal. She sees anxiety as the emotion that helps us take action and get things done. I knew that about fear (the question for fear is: What action must be taken? ), and in my work, I focus on the very useful and necessary aspects of fear. However, in my book, I sort of pushed anxiety off to the side because, honestly, it bothered me when people ran around being anxious. I just wanted them to calm down and focus themselves already, sheesh! When I wrote my book, I didn’t see anxiety as a purposeful emotion (I valenced it! ), because I made the common mistake of identifying it only in its mood state and intense state; therefore, I completely overlooked its gifts and its importance. I also overlooked the ways that I have relied upon the gifts of anxiety in my own life. Whoops. Dr. Lamia contrasts procrastinators, who put tasks off until their anxiety kicks in and makes them do their work with do-it-aheaders, who do their work ahead of time. I’m a do-it-aheader, and we’ve got a joke in our family about thanking Karla from the past. We’ll find some job I finished weeks ago, or unearth finished pieces to a project that’s crucial, or we’ll find important papers in my filing system, and we’ll say, “Thanks, Karla from the past, for making things easy!” Clearly, this thankfulness is a great motivator, because in each day, I think of all kinds of cool projects and jobs to do for the future happiness of my friends, my family, and myself. It’s a total win-win. It’s time travel that works! Before I heard Dr, Lamia, I would have said that I didn’t have anxiety, but I realized with a thud that, “Ooohhhh, I’ve got plenty of anxiety, but I somehow learned to respond to it at very early points in its appearance, so that it almost never gets to the level of a mood.” I realized that I’ve always paid close attention to subtle levels of anxiety and responded at very early points in its life cycle, which meant that I rarely experienced an identifiable mood-state form of anxiety. Consequently, I developed a valenced and non-nuanced empathic obliviousness to anxiety! Because I almost never moved into the mood state of anxiety, and usually responded to it in its soft and free-flowing state, I mistakenly identified my very subtle level of do-it-ahead anxiety as foresight, conscientiousness, or perhaps just being organized. I completely missed the fact that I was working with an emotion that was trying to prepare me for the future. We live and learn, so I finally learned to identify the nuances of anxiety, and I’ve welcomed anxiety fully into my emotional toolkit. When I lifted my veil of ignorance about anxiety, I realized that my behavior only appeared to be anxiety-free because I wasn’t in an anxious mood; however, I was using my anxiety about not having competed things as a way to help myself out of future troubles. Does that make sense? We’ve all experienced what it’s like to look for a specific shirt that turns out to need washing (disappointment, frustration), or how it feels to lose important papers (anxiety, fear, disappointment), or how it feels to be late (embarrassment, shame, anxiety). As a do-it-aheader, I’m working to avoid those unpleasant outcomes by confronting them before they have a chance to happen. I’m time-traveling in a way that’s different from a procrastinator (who’s trying to avoid an unpleasant future by not confronting it), but we’re both attempting to achieve the same goals. We’re both trying to avoid an unpleasant future. During the Forum interview with Dr. Lamia, a self-avowed procrastinator called in and explained that he could easily finish things that were pleasant, but that he really had to force himself to do things that felt like work, or to finish chores that he didn’t feel he was good at. The caller needed his anxiety to get to a fever pitch so that he could power his way through his procrastination and into unpleasant tasks. Even as a do-it-aheader, I totally get that. When I have a miserable task to accomplish, my entertainment-and-online-gamer habit takes over, and I hide from the misery and discomfort and doubt. However, I’ve learned to pay myself with procrastination, such that I’ll tell myself: “Okay, you can play three games of [insert current favorite game here] or watch a show, but then you need to write that difficult letter or clean out the crisper drawer in the frig.” That may sound silly, but it helps me remain emotionally honest. Because honestly, I don’t want to write that letter or clean out the wretched crisper drawer. It’s miserable work – and anyway, what if I say the wrong thing in the rotten letter and make things worse? We can all stand outside the situation and know that I’ll feel better once these miserable tasks are completed, but it’s a long slog through foul terrain before that can happen. So if I have to do those odious things, then I need a reward first! And though I didn’t know which emotion I was working with, I somehow learned to play with and work with my procrastination and my anxiety, rather than being worked over or overwhelmed by them. Score one for the unintentional empath! What I see in career procrastinators and anxiety-prone people (mood-state anxiety, that is), is that their uncomfortable relationship to procrastination and anxiety becomes a kind of lifestyle, and very much a part of their self image. Procrastinators and anxiety-ridden people may feel some shame about their behavior, but because they’re in a feedback loop with the powerful mood-state anxiety (which affects hormones, stress reactions, eating behaviors, sleep patterns, and more), they may feel as if they have no control over it. As a result, their mood-state anxiety may become an unwanted but persistent house guest which, eventually, they just learn to live with. Some people even begin to champion their anxiety/procrastination cycles (think of those signs that flaunt a messy desk as a mark of genius). My suggestion for interrupting this feedback loop is to turn toward the anxiety and procrastination and ask the question for anxiety: “What really needs to get done?” The word really is key, because if you simply ask your procrastination what needs to get done, it might answer: “Eat chocolate, go blog hopping, play Angry Birds, watch movies …” and then it’s four hours later and where are you? Did those things really need to get done? But if you ask your mood-state or intense anxiety what needs to get done, it might answer: “Check the stove to see if you turned it off, now polish the doorknobs, now wash your hands, but where are the nail clippers? What about reorganizing the closet or changing the oil in the car? Oh, did you check the stove?” And again, it’s four hours later, and you’ve been sent on any number of fool’s errands. When any of your emotions (or the emotions of others) is caught in a feedback loop, it’s very tempting to turn away (or run away) and ignore them, but you can make significant improvements in your Empathic Accuracy if you can clearly identify emotions and engage with them empathically. When you can understand the reasons that emotions arise, you can help them do their proper work so that they can recede naturally and you can ground and focus yourself again. This process of identifying, listening to, and responding to emotions so that they can move onward – this is how you develop Emotion Regulation skills. This next skill is a specific healing practice for anxiety. Anxiety has a purpose and a function, and it’s a really important one; it’s your task-completion emotion, and it’s your procrastination alert system. Anxiety can be an intensely action-focused emotion, and expressing it when it’s intense, or when it’s in a feedback loop, can be pretty problematic – it can run you in five different directions at once. However, repressing anxiety isn’t a very good option, because anxiety will keep bubbling up – it’s got tasks to complete! But here’s the rub when your anxiety is in its intense state: Even channeling it can be problematic if you’re highly activated (it might overwhelm or confuse you, especially if it’s in a feedback loop) – so we’ve got an empathic mindfulness practice for anxiety. In Conscious Questioning, you turn toward your anxiety and identify each of the issues your anxiety is responding to so that you can organize all of your activation. This practice will help you ground and focus yourself again. You can do this verbally by asking yourself (out loud) about each of the things that really need to get done (see Janelle’s practice for anxiety) – but I find that it’s very helpful to write things down as well. Writing is a way to physically express your anxieties, become aware of them, and organize them intentionally. And here’s the interesting part: Speaking or writing out your anxieties is an action. It counts as an emotion-specific action that will help your anxiety calm down a bit so that you can ground and focus yourself. Empathic mindfulness skills help you make real changes in your behavior, in your approach to emotions, in your outlook, in your tension levels, and in your empathic skills. No matter how activated your emotions are, you can use your empathic skills to engage with all of them and figure out what they’re trying to do. Remember though, that if you do what you can to empathically address an emotion, and it’s still too much (How much emotion is too much? ), please reach out for help from a trusted friend, counselor, or healthcare provider. Sometimes, especially with a very intense emotion like anxiety, we can all use a little support to bring an emotion back into balance. Karla, you have been my greatest teacher for the past couple of years – since one of my wonderful and wise friends suggested I read The Language of Emotions! I deal a lot with depression and anxiety – and I found the methods you discuss here for dealing with anxiety on my own years ago, so I know they work…unless you’re an emotional mess like I have been lately. I’m taking my meds and I’m working on my stuff even though it’s uncomfortable, but I still get myself into the occasional tizzy worrying about things – things I need to do, things I hope I did right, things I think I should do. It feels like anxiety, but is there something else in there, too? I’m still reading The Art of Empathy…maybe I’m just not there yet. But THANK YOU for you work!! I tell people about it in my blog all the time!! Hello Alicia! It sounds to me as if anxiety and shame are working together a bit here — so it’s not just the procrastination alert and planning for the future that anxiety helps you with, but it sounds like it’s also about checking on your behaviors and holding yourself to a standard, which is the work of shame. It might help to ask the questions for shame and see if there are any behavioral rules you’ve set for yourself that are hard to live up to. Remember that shame’s job is to help you live up to the standards you agree with. If you’ve got some standards in there that aren’t actually workable any longer, it’s time to burn your contracts with those standards and choose new standards that are more suitable to your current situation. Shame gets a lot of bad press, and as we all know, when shame is inauthentic or applied as a control mechanism by others, it can be gruesome. But it’s just doing its job, which is to help people live up to the standards they agree with. When people’s standards are self-chosen and self-respecting, then shame can do its job in a gentle and supportive way. Shame is delightful when it has delightful standards to watch over. Thanks Karla! That makes a lot of sense, actually – I tend toward perfectionism…time to burn that contract! You’re my hero! I am a little confused. Is Dr. Lamia one person? A wife/husband team? Hello Kerrie, and thanks for the question. That does look confusing, so I changed the second sentence to read “The caller.” I hope it’s clearer that I’m writing about a man who called in to ask Dr. Lamia a question on the Forum radio show. Thanks! Yes, that change does help to clarify, and thank-you for writing about anxiety in your prolifically minable empathic style.